Yesterday Alderwoman Marlene Davis introduced Board Bill 118, a proposed ordinance to approve a redevelopment plan for the Flying Saucer at 212 S. Grand Boulevard, which is part of the Council Plaza National Register Historic District. 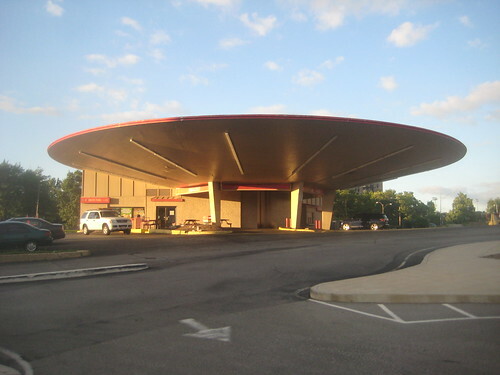 The redevelopment plan calls for demolition of the iconic Flying Saucer that was constructed in 1967 as a Phillips 66, and has since been home to Naugles and then Del Taco over the past 25+ years. The Flying Saucer, according to developer and owner Rick Yackey would supposedly be replaced with a new "pedestrian friendly" chain restaurant building, which would likely be more pedestrian in its design. As with most redevelopment plans, this one is predicated on the finding of "blight", and thus the desire and mandate to rid the area of "blight". Attached to Board Bill 118 is the Blighting Study and Plan prepared by the LCRA (embedded below). The actual Blighting Report is a barely 1 1/3 page checklist at the end of the document. Each statement checked yes or indicating the presence of a condition contributing to "blight". Four of the seven individual items checked give the explanation that the "area" has or is conducive to crime. The very ironic thing about this is that Rick Yackey was a partner in the redevelopment of the long vacant union hall portion of Council Plaza, immediately south of the Flying Saucer, into The Flats at 374, which is stylish high-end student housing for SLU that opened in 2009. He is also partnering in the current rehabilitation of senior housing in the two high-rises underway immediately east. One would think that completion of these two developments, which were blighted themselves for their redevelopment would rid the "area" of "blight" and crime. Maybe criminals are simply attracted to tacos? In any case, the logic of declaring "blight" is fuzzy a best. Even if "blight" does exist, demolition is not the cure. The existing building, which has been continuously occupied and is in no way structurally unsound. Any building that has had basically the same tenant for 25+ years is going to need some polishing. Of course bogus blighting studies are nothing new. Remember when West County Shopping Center was "blighted"? Bogus or not, Board Bill 118 passed its first read, and is on to the Housing, Urban Development and Zoning Committee, which will meet this Wednesday, June 29th at 10:00 am in room 208 of City Hall. This hearing will be the public ONLY opportunity to comment on the proposed redevelopment plan, so please put this in your calendar, plan to attend, and get up to speak out. In the mean time, email or call Marlene Davis. More importantly, email or call your alderman and tell her/him to throw courtesy out the window. this is what passes for a "study" in saint louis? the alderwoman fills in a handful of checkboxes? let's see... nobody consulted except for the developer - check. no concrete plans for redevelopment - check. Bogus crime assertions on the "blight study" - check, check, check, and check. Join the Facebook page and sign the petition. Over 10,000 followers in under a week. The "problem" with redevelopment of any kind (especially in the City of Saint Louis) is that it "requires" blighting...a document combining inane logic and lying in order for property owners to ensure their property rights! Blighting should be used only rarely. Two other things: This "iconic" building was NOT considered a treasure when it was built...people were apoplectic over its design, a very short 47 years ago. The criteria for creation of Historic Register Districts are easily manipulated; all districts, like all structures, are not equally sacred! the value of a building does not rest on whether it is "iconic" or not. saint louis' many brick flats are not "iconic" yet they are valuable in that they are urban, attractive, representative of our history and irreplaceable (i.e. the materials and skills required to build them are no longer available). maybe the real "problem" is that developers are more concerned about throwing up some cheap architectural abortion and making a quick buck than they are about conservation or preservation. and as for this broken record of "property owners should be able to do whatever they want with what they buy", that has never been the case and never will be the case because each property owner shares the planet with 7 billion other people. that's just the way it is. it seems that only the greediest people are bothered by that. wow... and maybe the developer shouldn't apply for national historic register designation in order to get TIF money and then use Marlene Davis to push through a blight designation in order to bypass the preservation review that accompanies that designation. that is F*CKING crooked! The most interesting thing about this situation is whether the Young Turks on the Board of Aldermen, (French, Cohn, and Ogilive), will line up on the side of aldermanic courtesy? I understand that the first vote on this bill last Friday was far from unanimous. Someone posted the count, I think it was 15-9 (I might be off on that) but I'm guessing the younger progressives voted no. 15-9? That's amazing. I wonder why the 9 voted against? So much for Roddy saying the building is toast!